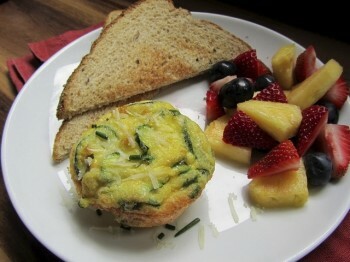 Mini zucchini frittatas are a nice, healthy surprise breakfast for anyone's mom. Photo by Fran Hill. I don’t have children, but don’t say that in front of my pups. They may have fur and four legs, but my two dachshunds believe they are my babies. Just as it would be with human children, in my house life often revolves around those little guys’ wants and needs. Honestly, I may think that I am taking care of them, but they really do look out for me in their own ways. Ace is pretty demanding that I get a little exercise by throwing his tennis ball, and Sissy tends to my emotional stability by creating downtime to rub her belly. We are a good family. On Mother’s Day, they even remember me…with a little help from my husband. The pups have surprised me with a supply of paving stones, strawberry plants and a new mower. They know that spring draws me outside to spruce up the yard, garden and patio, and their gifts often feed that passion. While I love those gardening gifts, I would be lying if I didn’t admit that I wish the dogs could really feed me. I would love breakfast in bed, or a lazy brunch on the patio. It is no secret that I have a soft spot for stacks of blueberry pancakes, mugs of tea, bowls of fruit salad, strips of crispy bacon and eggs. Poached? Scrambled? Omelet? How about a frittata? How about Mini Zucchini Frittatas? That would be a very happy Mother’s Day. Preheat oven to 375F. Heat oil in a large skillet and add zucchini with salt and pepper; sauté just until tender. Whisk chives, zucchini, and 1/2 cup of cheese into eggs. Divide mixture evenly among 6 (well-greased) muffin cups. Bake for 14 minutes, until tops are puffed and middles are set. Sprinkle with remaining cheese and serve. Serves 6. Heidi, is that a generalization about husbands or a dig at yours in particular? I love frittatas because they're easier than omelets, and these look especially tasty. Thanks for the recipe!